Learn how to solve a system of equations using elimination. To solve a system of equations using elimination, you start by adding them together to form one equation. This is done by combining like terms. However, you have to set the equations so that a variable cancels out when you add the 2 equations together. 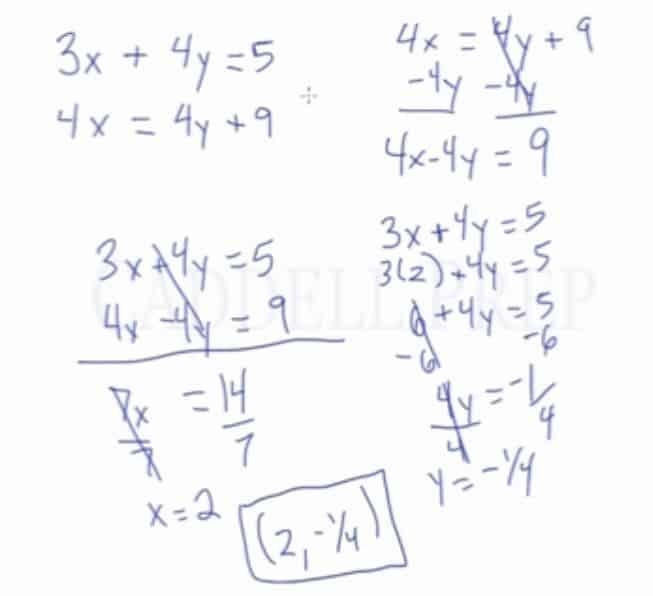 This can be done by multiplying each equation by a common factor so that a variable in both equations can be canceled out. You should only be left with one variable and real numbers. After that, you simplify to find what that variable is equal to. You then plug your answer into one of the original equations to find the other variable, and to find the coordinate. To check your answer, plug both x and y-values into an original equation to see if it holds true. So the coordinates for the point of intersection would be (7,-10). In this lesson, we’ll review elimination which is a method used to solve systems of equation. We’ll do elimination by adding the equations together in such a way that one of the variables cancels out. Here we have an equation with only one variable. We can easily solve for . But let’s take a look back at how it worked. First, equations should be written in the same format. Make sure that they are lined up correctly when we add them. Another important aspect is that when we add them, one of the terms has to cancel out. Now, let’s use the value of to solve for . Since we used the first equation to solve for the value of , now let’s use the second equation for checking. In this system of equation, the equations are not written in the same format. So, we will rewrite the bottom equation to follow the format of the top equation. Let’s bring the -term to the left by subtracting on both sides. Now, let’s use this to solve for . It’s okay to get a fraction as one of the variables. When two equations are not written in the same format, just manipulate the function or equation by bringing over terms in the order you want them to be. And then we can use elimination. Let’s look at this system of equation and try to solve using elimination. It’s in the correct format and lined up correctly. But none of the variables can be canceled out if we add them up. Now, we have to change one of the equations so we can use elimination. To change it, we just have to multiply the equation by a constant. We can multiply the bottom equation by so our -term will be the same. So the process, if a system of equation has no variable that can be canceled out, is to pick an equation that you can multiply a constant number. Make sure that the answer will result in an equation that is canceled out by the other equation. Now we can use this value to solve for . Let’s plug it in the top equation. To recap, we have to multiply one equation by a number so one of the variable will cancel out. Let’s look at a second way of doing this. On the first method, we cancelled -term. But what if you want to get rid of the ? Here, it’s not easy to multiply so the will cancel out. We have to multiply the two equations by two different numbers so we’ll get the same -terms. We have to think what is the common multiple of and . We’ll multiply the top equation by and multiply the bottom equation by so we’ll have on both equations. We will be adding the equations so if we add both positive numbers, we’ll have positive too. So, let’s make one of the multipliers be negative. Just make sure to make one of them positive and the other negative so we can cancel out. Our answer is the same as our answer using the first method. Let’s use to solve for using the top equation. Sometimes it possible to multiply one equation by a number to get one of the variables to cancel out. Or you can also multiply both equations by two different numbers such that one variable will cancel out. Just make sure that you’re doing it on the variable you want to cancel out. In this case, we want to cancel out the -terms, the coefficients were and to get a common multiple of . Make sure that one is positive and the other one is negative so they cancel out when we add them.